It is apple and pumpkin picking season! 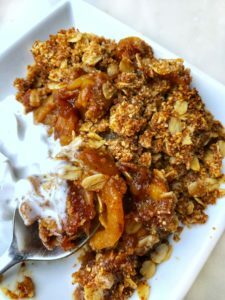 My husband and I have this tradition where we go apple picking every fall and with all those apples we make our favorite apple dish; apple crisp! 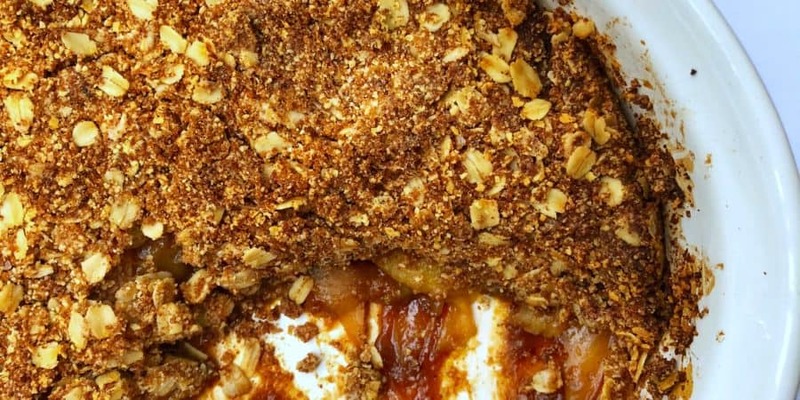 Something about the soft gooey inside and warm spices along with the crunch factor of the topping make it a perfect fall dessert! This year I recreated it to be vegan, gluten free, dairy free, and no refined sugar yet still tasting amazing. Mix together all the ingredients for the filling in the 9 by 13 baking dish. Mix all the ingredients for the topping in a bowl and then top the filling with this mixture. Spread it out evenly. Bake in the oven for 50 minutes till apples are fork tender and the top is golden brown and crisp. Take out and enjoy warm with a scoop of vanilla ice cream or coconut whipped cream! This is in the oven right now! Thank you so much! Off to my next Fufu recipe! Thinking of making this again today! Thanks for the awesome recipe!!! !